Spending a part of your summer vacation in Greece, is a beautiful experience. 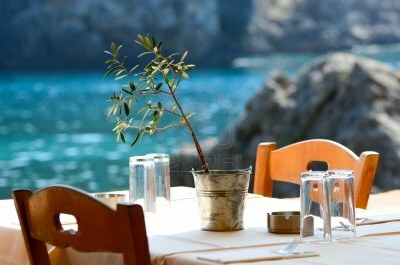 If you combine both beautiful sights and enjoyable dinners, you have lived the essence of the Greek vacation. When I’m on holiday, I like to enjoy the relaxed time frame for every activity. However I’d say I’m rather organised when it comes to picking a place to eat. My criteria are strict in restaurant selection, because I pay attention to ingredients, flavors, local recipes and the character of the place I visit. What I look for, most of all , is quality. I don’t want to end up in some touristy restaurant, with an extra large menu that tries to suit all tastes. But what can someone eat in Greece? Some famous summer dishes of Greece is Gemista, which is vegetables stuffed with rice (tomatoes, peppers, vine leaves, zucchinis etc) and Tourlou, which is also a vegetable based recipe made with a variety of fresh vegetables, olive oil and tomato sauce. Both are made with vegetables of the season, so they’re at their best! It’s one of the crucial chapters of Greek Gastronomy, as it includes versatile tastes and a vast variety of dishes. It is common here in Greece, to order only appetizers along with tsipouro and ouzo. There are many different salads to pick from, like Dakos or Choriatiki served with feta cheese, Greens with lemon and extra virgin olive oil etc. There are many different cheeses made in all parts and islands of Greece, so wherever you are, you have 1 more new cheese to try. Fritters is also a common appetizer. The main ingredient may vary (tomato, potato, zucchini, aubergine) but the concept is the same. If you like meat options, you will find plenty of choices depending on the area. Pork, veil, goat, lamb are all included in our national menu, with recipes’ variations. In Crete , there is a special recipe on goat meat, called “antikristo” . Its called like that because of its position, opposite of the fire (opposite = antikri). Pieces of meat are sticked in an iron installation, in close distance to the fire. When its almost done on one side, it is turned around. One of the most authentic tastes of Greece is souvlaki. Souvlaki is the food with no boundaries. It’s eaten at all times, with all kinds of meats, with all kinds of fillings, and you can find it almost everywhere. It’s the burger of Greece. Or shall we say, burger is another kind of our souvlaki? Pork or Chicken Gyros, pork or chicken skewer, Greek souvlaki is enjoyable at all times and is without doubt one of the classics of the Greek cuisine. Greek enjoy fish a lot! With so many islands, wouldn’t we love sea and fishing? If you pay a visit to a Greek island during summer you will find plenty of fish dishes to enjoy. Fried, oven baked, rack baked, boiled, or cooked with tomatoes and onions, fish can be a nutritious meat alternative for the whole family. It can also be eaten as a soup, and when it has a variety of fish we call it “kakavia”. When eating in Greek tavern and you ask for the check, most likely you will also receive some fresh fruit or the dessert of the day. It may be loukoumades -the puff balls with honey or chocolate on top- maybe semolina halva, or even Greek yogurt with fresh fruit. Greek cuisine is not only a blog post. It’s intertwined with our history, our folklore tradition and our cultural roots.However, I decided to point out some good hints, for you to search it some more. The beauty of the Greek Gastronomy, is the ability it gives you to discover its gems!